I remember my Dad making me a large aluminium plate that went across the tank of my CBR600 when I was younger, to carry our family’s massive VHS-C camcorder. When I hit ripples in the road, the footage would shake as the tape left the recording head, and editing was a nightmare of cables to the video recorder. Then GoPro changed everything. 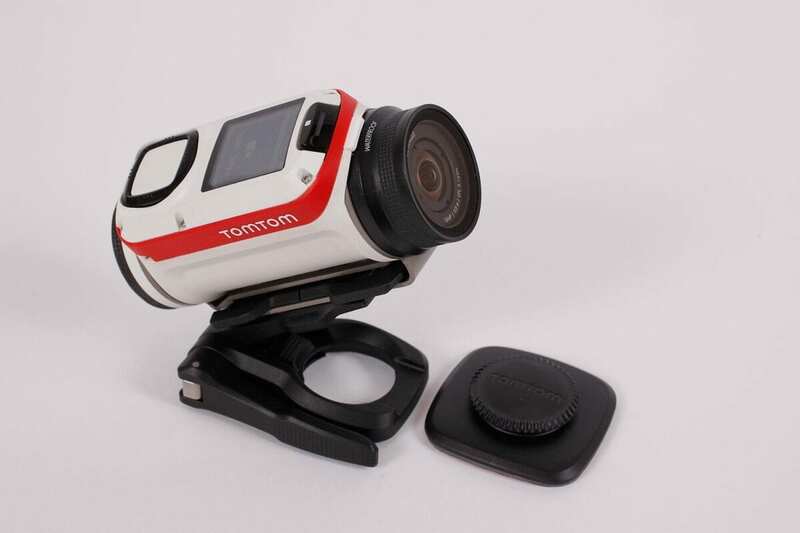 The reference for action cameras, a whole host of others followed; now TomTom has entered the fight, and like its Rider sat-nav, it’s designed to be as user-friendly as possible. GoPros have moved on a little since the Hero 3 I’m using as a comparison, but the interface hasn’t changed much, and the mounting system is unaltered. While there might be slight advances in picture quality, for users like you and me, the high-end cameras all offer incredible HD video; what sets units apart is their ease of use. GoPros aren’t the most intuitive, with their small, basic display, and no idea of what the camera can see. 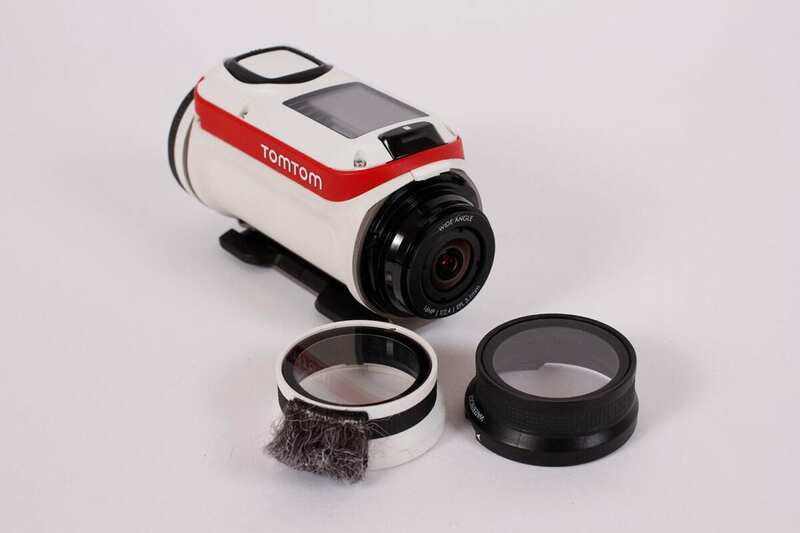 Some Drift cameras have a full colour screen that acts as a viewfinder, and makes setting options much easier. 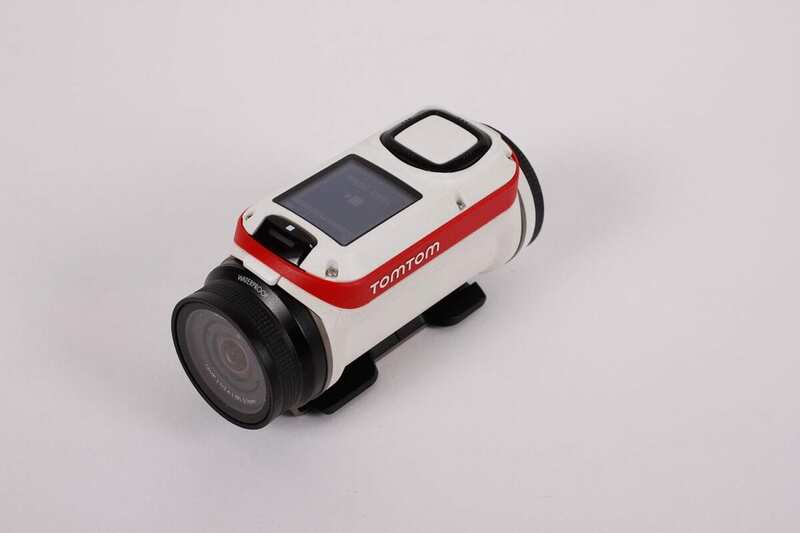 The TomTom doesn’t have a digital viewfinder, but its menu structure is the most simple and intuitive I’ve used. The GoPro and TomTom can both be linked to smartphones or tablets, and while later versions should be a lot better, My Hero 3 is horribly laggy, the app displaying footage a few seconds behind the camera; not so with the TomTom, which is almost instant. Linking though the app allows the Bandit to be very easily updated, and as long as you have a tablet or smartphone, you need never touch a computer again. The app streams everything shot on the camera instantly, allowing you to mark favourites and edit your own videos to a basic level, before exporting them. Of course, you can just plug the combined memory holder (it takes standard micro-SD cards) and battery into your computer to edit the files, and while the app can’t offer the same level of control as ‘proper’ editing software, the ability to create little movies whilst sat on the sofa mustn’t be underestimated. I have hours of previous footage that I’ll probably never get round to editing, but this morning I filmed our daughter riding an electric bike for the first time – I edited it on my phone in a couple of minutes, and had a fun little video that, while it won’t win any Oscars, is a memory my wife and I will treasure. When I first started testing the unit, I thought I’d stick with Final Cut for editing, but now I’ve used it, I much prefer the immediacy of the app. It’s like stills – I’m a keen photographer with a collection of decent kit, but the photos my wife and I really love are the ones grabbed with our phones; technically not the very best they could be, but wonderful moments captured. 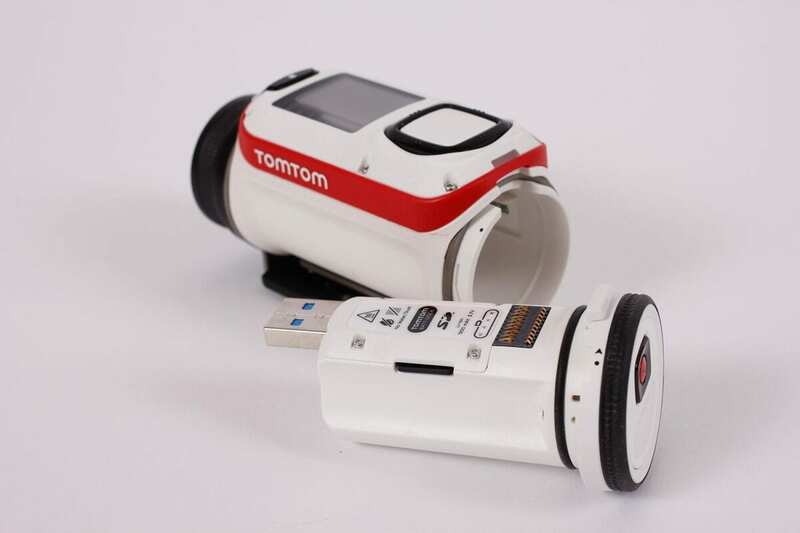 You can very quickly add music from your own playlists, and as the TomTom has a built-in GPS, you can also add an overlay showing your speed, G-force, altitude or – if you have the aftermarket sensor – your heart rate. 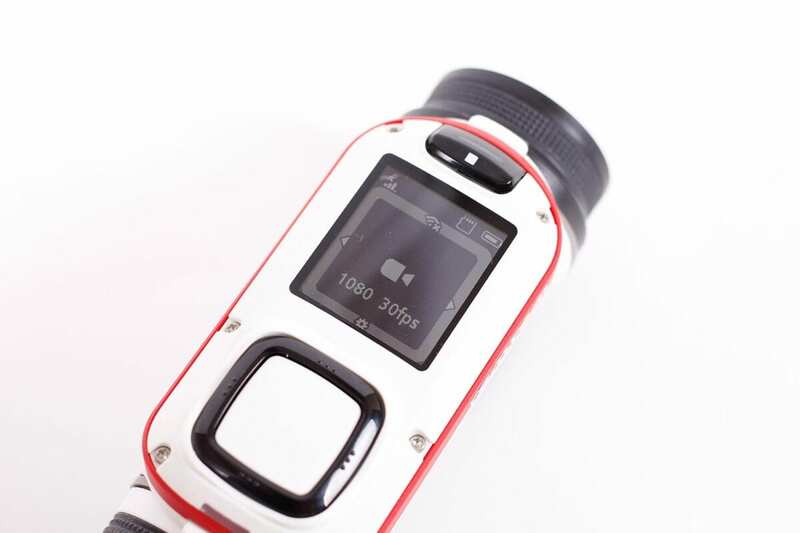 The camera automatically marks highlights based on these sensors, and you can mark favourites during the action with the large rear button, via the optional remote or whilst editing the clips. The mounting system is inspired, being very easy to clip on, secure, yet removable even with winter gloves. The camera rotates in its own bracket, so it’s easy to get a good position whilst keeping a low profile against your bike or lid. And with the optional 360° pitch mount, it can be positioned almost anywhere. It’s much simpler than a GoPro, and while it feels heavy at 192g, my Hero 3, with the case you need for bike use, weighs 216g. Along with two adhesive mounts, a Go-Pro mount adaptor is included… the only slight omission for me is a tripod screw mount, though one is available as an option. 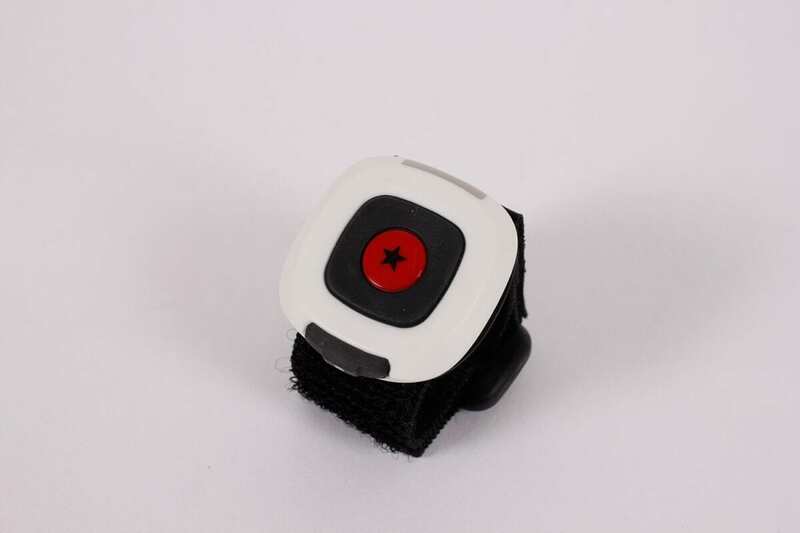 Video quality is great – check the link bit.ly/banditreview to see comparisons with the GoPro. You can shoot in 1080 at 30fps or 60fps, and 720 at 60fps or 120fps. Slow motion video is also easy (and retains the audio), at 2x in 1080, 4x in 720 and 6x in WVGA (800×400). Timelapse movies can be created in 1080 or 4K resolution, with intervals of 1, 5, 10, 15, 30 or 60 seconds. Cinematic modes also offer 15fps at 4K and 30fps at 2.7K, though of course you can only shoot in the full wide mode, not the narrower ‘normal’ of the others. 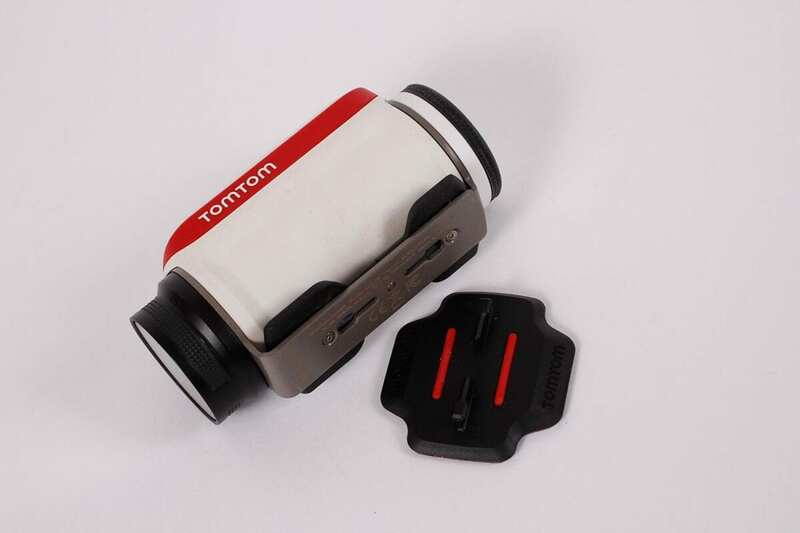 Where the TomTom does lose out is in the audio – the microphone at the front is great for general use, but picks up all the wind noise when riding. 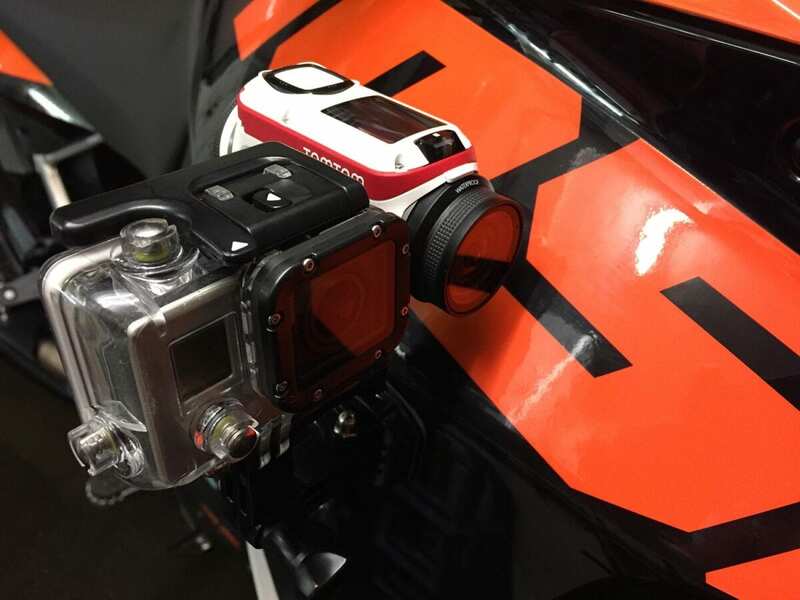 The waterproof lens cover reduces this significantly (and is vital if you ride in the rain, making the camera waterproof to a depth of 50m), but it still suffers from a sharp ‘rattle’ when mounted on the bike, which seems to be caused by play in the brackets. 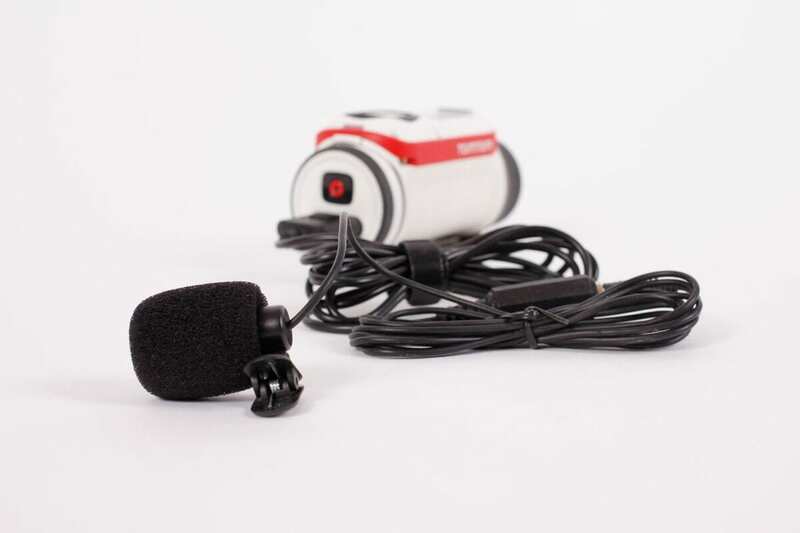 I tend not to use the audio when riding anyway, but an optional microphone can be easily plugged in to pick up sound from inside your helmet, or from elsewhere on the motorcycle. Personally, I find the ease of use in all circumstances outweighs the poor audio for riding. One thing to note – as you’re using WiFi to connect your phone directly to the camera, any other connections are lost. This means that if you upload a video straight from the app to Facebook, YouTube etc, you’ll be using your mobile data. To avoid this, simply save the movie to your phone, then send it when you’ve disconnected the camera. Battery life is very good – I used the Bandit to shoot and edit video over a period of more than five hours. A full charge sees it last for over two and a half hours of solid shooting at 1080p, and as the camera goes into a sleep mode automatically when it’s not used (and is easily woken with the button or remote), this is far more suited to a day’s riding than my GoPro, which runs out of juice much more quickly. Charging is simply a matter of removing the combined battery and memory card (Batt-Stick), and plugging it into a USB port or charger. Additional Batt-Sticks are available, but I can’t see myself needing one. I’d recommend the Premium pack, at £379.99, which includes the remote, a bar mount, waterproof lens, 360 pitch mount and a power cable that’s useful for long timelapse shots, though I filmed one for eight hours, and the battery still showed 46%. 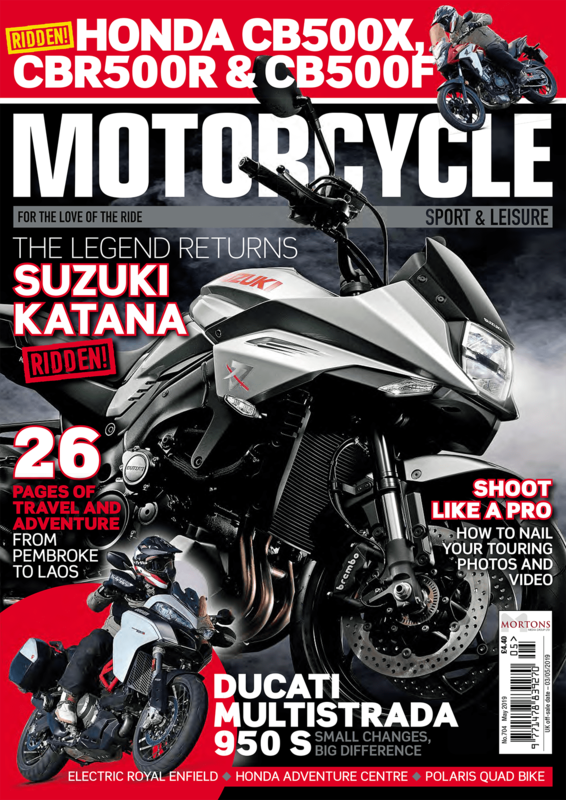 The Bandit is not cheap, and it’s let down a little by the sound when fixed to a bike, but it’s still a system I expect to get a huge amount of use from – video just got a whole lot easier!